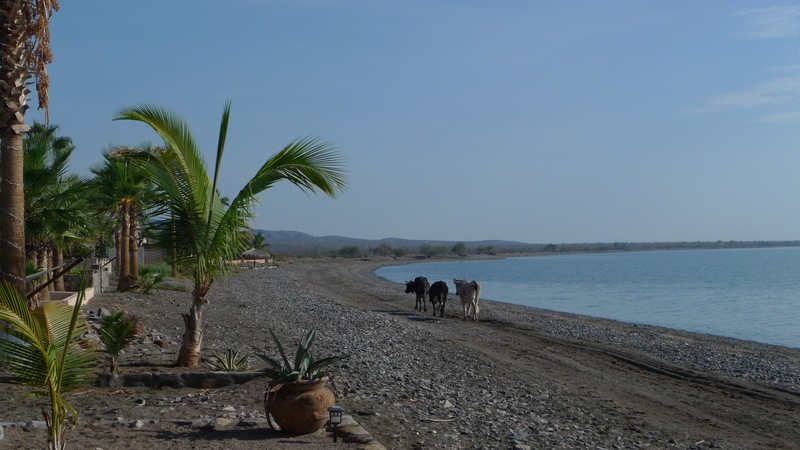 Okay : the unfenced range cattle are entertaining as they wander down the beach during daylight hours. They piss off the dogs, but can be dissuaded from ‘home’ invasion by yelling, the blast of a hose, or a kind of ‘run-at-em’ motion. At night – Not the same deal. Last night, the dogs were just going off! Shorty & Diego were barking at the top of their doggy vocal chords – and relentlessly. Inside, Buster joined the howling chorus. Yes, the dogs were doing their one job – GUARDING! I’d been asleep for a bit over an hour – and in that groggy deep space where even though I knew I should get up, I kept hoping the dogs would simply settle down. “I’ll be right there,” I responded. I’ve just got to throw on some clothes. When I opened the front door, Buster tore off toward the tinkling bell one of the cattle has on his neck. I rounded the corner behind him, just as Jeannie heaved a rock. I dodged the rock and the cow made a dash out of the yard – right toward me. Horns and all. I leaped behind the F-150 and the cow kept on going. One down, one to go. I stepped into the yard and tried to shoo the second one out the now open fence, while Jeanne searched for more rocks. How the fence got open, I have no idea. Maybe the cattle pushed it open, but when the second intruder cleared the gate, I pulled it shut and reset the chain. I reset the cylinder, sent a ‘good night’ to Jeanne, along with some shared belly laughs at our cow filled ‘hood’ and turned back to the house – only to step right in a fresh mound of cow poop! GOODY! Now I had to shower and wash my slippers and listen to the cling-cling of the belled-bull wander off into the night. Still beats the 405 at rush-hour.